A quick reminder to people who have sent me BBM requests to please do so again. I’m getting your requests and I try to accept them but my iPhone 5 is very glitchy. Thanks! This site finds Throwaway Tickets for you. For example here is a throwaway ticket that is cheaper. Not a bad option if you’re not familiar with ITA. Westjet launches new flights to Dublin! The fares are very reasonable! Availability of seats from St.John’s to Dublin is too bad. 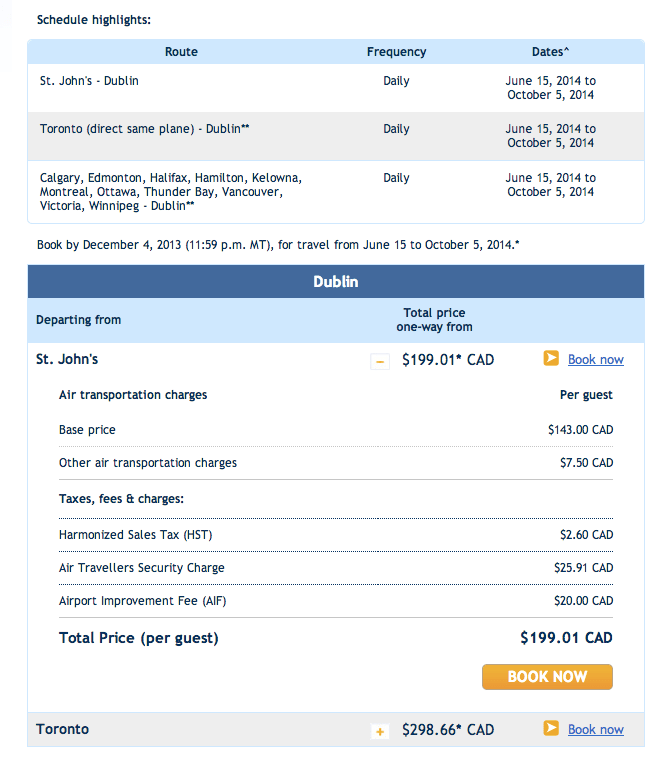 I only can find $199 fare from YYT -> DUB only after Sep. 29th, so there is no $199 return ticket available. Still, $199 for one-way is great, but not that fantastic unless I can get a ticket for round-trip. Reminder: Please add me to the BBM list. Thanks!